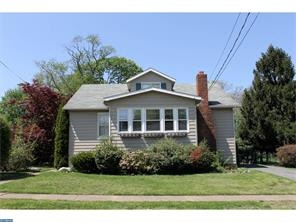 Maple Shade 4 Bedroom with Huge Lot! Interior Features Set on a beautiful Tree lined street, this 4 Bedroom home sits on a Park-like Gardeners Dream lot, which is over 1/3 of an acre large! Inviting curb appeal with decorative window boxes greet you before you'll enter into the Heated and Bright front Sunroom. Spacious Living Room includes a full wall Brick hearth with Gas Fireplace and the Generous sized Formal Dining Room showcases the original wider planked hardwood flooring. Remodeled Kitchen includes Granite counters, Island seating, Huge Pantry, appliances included with Gas cooking, and access to the rear yard. The main floor also offers a spacious Bedroom and Full Bath plus 2 large closets! Upstairs features 3 more Bedrooms, a built-in Desk area, and lots of storage in the eaves. Remarkably Large and Deep Basement just waiting to be Finished - includes a Full Perimeter French Drain, 2 Sump Pumps, Laundry area with double sinks, additional half bath plumbing, and Bilco door exterior access!